Published to Google Play by Noodlecake Studios — one of my personal favorite publishers — Last Horizon can be picked for $2.99, with no ads. This is a minimal, space exploration game, in which you must pilot a rocket ship to distant stars in search of a new home for the human species. Along the way, you will visit rocky planets to mine for ore to fix your damaged ship, collect oxygen from ice and garden planets, and harvest other resources to help terraform a new world for all of us. The gameplay is extremely simplistic. To thrust into space, leaving our old world behind, you hold down on the screen, with two single buttons for turning left and right. As you orbit worlds, their gravitational pull will bring you closer, and it is your job to land your rocket safely using the thrusters. If you smack straight into a star, moon, asteroids, black hole, or a massive sun, you will die and have to start all over. The compass at the bottom of the display points you in the direction of which you need to go. At first, the game took a bit to get used to in terms of mastering the ship’s movement, but once you nail down the thrusts and landings, the game moves along rather quickly. From what I saw during my gameplay, there are four missions or “flights” you must complete. Each mission gets harder in difficulty, with more debris floating in space for you to avoid. In addition, during the later levels, you also come across alien life. Do they wish you harm? You will have to find out for yourself. 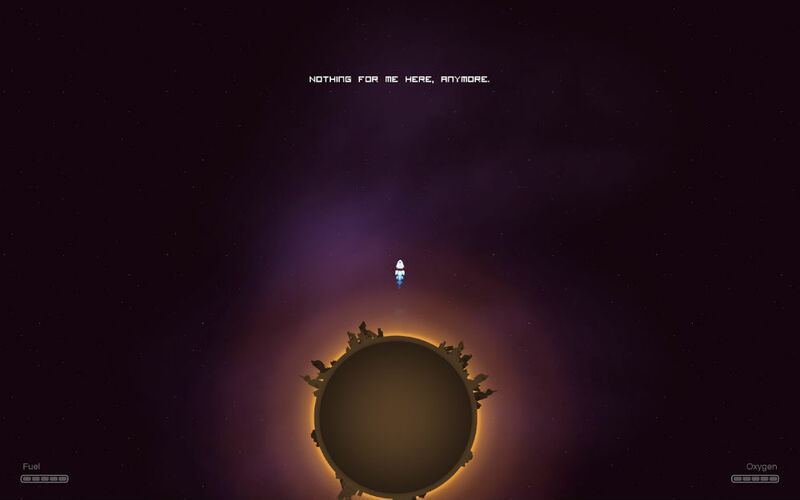 Priced at $2.99, the game features a great little soundtrack, plus fun visuals of space. With no ads, it’s a must-have for any wannabe space explorers among us.